Bacteria in decay can infect and kill the nerve in a tooth. The bacteria living in the nerve chamber acts as a source of infection and can spread down the root and into the jaw bone, gums and soft tissues. 1 Mechanical cleaning of the nerve chamber. 2 Widening and cleaning all canals in the tooth root and preparing an internal shape for the filling material. 3 Sterilisation of the infected root canal. 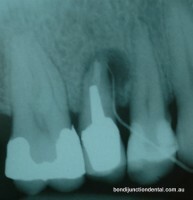 4 Filling the root canals as close as possible to the root end. Teeth in different parts of the mouth vary in the number of their roots and the number of canals within their roots. There are usually between 1 to 3 roots containing 1-4 canals. Some roots have more than one canal. Root therapies vary in difficulty depending on root curvatures, blockages and access. Nerve treatments are usually completed over two or more one hour visits depending on complexity. The nerve canals are prepared during the first visit and medicine placed into the tooth. The second visit, usually a week or more apart, is to fill the canal. In some circumstances it may be possible to complete a nerve treatment in one visit. A minimum of three X-rays is required. Success rates vary from 94 to 98 percent after 5 years. Failures may occur due to blocked or inaccessible canals, severe curvatures, fractured instruments, inadequate preparation, inadequate root fillings or poor seal of the final restoration allowing re-contamination of the root canal. Failure may require the removal of the tooth if re-treatment is not possible. A weak tooth is prone to fracture. Most nerve treatments are performed on teeth that are already structurally weak due to previous large fillings or from decay. A stainless steel band may be placed to minimise the risk of tooth fracture during treatment if the tooth is weak or a crack in the tooth is suspected. Where a tooth is so weak that the tooth can not be restored a better option may be remove the tooth than attempt the root therapy. Some inadequately root filled teeth respond to re-treatment with an approximate 80% success rate. Some teeth have an existing post in a tooth that needs to be removed before re-treatment may be attempted. Attempting to remove a post has a risk of root fracture and resultant loss of the tooth. 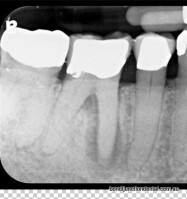 Tooth has an existing post crown and an infection associated with a root that split in normal function. 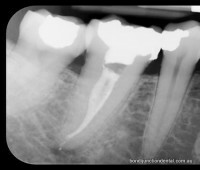 A split root is not treatable and the tooth was removed. A compromise treatment is available where the nerve in the pulp chamber of the crown or the top half of the tooth is removed. No attempt is made to shape or fill the nerve chamber in the roots. An anti-biotic medicine is placed into the pulp chamber and over the nerve openings in the roots. A pulpotomy often gives a short term reprieve with a 50 percent success rate after two years. These teeth usually become sore later and a root therapy may then be re-considered when the tooth becomes sore. Some teeth are not treatable and an extraction followed by implants, bridgework or dentures may be the better treatment option. Antibiotics and analgesics may have to be prescribed during an acute infection to stop the infection spreading into the bone or soft tissues. Antibiotics alone will not cure the problem as the antibiotics can not reach the source of the infection within the nerve chamber as the blood flow to the tooth is lost once the nerve dies. Antibiotics alone will not cure an infected nerve chamber and the infection will re-occur some time later if a nerve treatment is not carried out. 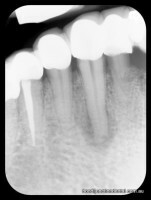 Most root filled posterior teeth are structurally weak and prone to fracture. It is strongly advised that all root filled teeth have cusp protection to prevent future fracture. 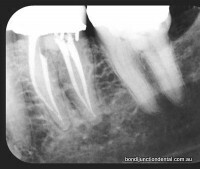 Treatment usually requires a post, core and crown. Most fractures occur within 5 years. A post may be cemented into a root if there is insufficient tooth structure above the gum to hold a crown. Placing a post involves additional treatment and costs and should be scheduled after a suitable period, ideally within one to two years, following the completion of the nerve treatment. Please feel free to discuss treatment or costs with either myself or any off our staff. Further information is available in the Australian Dental Association pamphlet which will be provided to you.